“The Sue Our Cities Bill” is a bullying tactic to financially punish PA towns that take action to protect public safety. It starts with a confusing doctrine called preemption, undermines traditional legal rules, and is really a gift for the gun lobby at taxpayers’ expense. Why is This a Problem for Our Towns and Cities? Preemption means that the state decides that only it (and not local municipalities) can enact certain regulations. PA has preempted the regulation of the “lawful ownership, possession, transfer or transportation of firearms, ammunition or ammunition components.” But our state legislature has consistently failed to fight illegal guns and gun trafficking or keep guns out of the hands of those who should not have them. In a large and diverse state like PA, our cities experience gun violence differently and need different tools to keep their communities safe. Some PA cities fight trafficking and straw purchasing by requiring reporting of lost or stolen firearms. Some make their cities safer by regulating the carrying of firearms in city buildings and parks. The gun lobby has repeatedly tried to sue cities like Philadelphia and Pittsburgh. 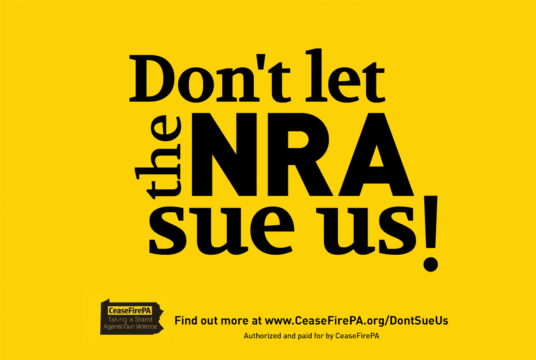 But several PA courts found that the NRA lacked standing to sue. Standing requires someone to have a real stake in a case – to have suffered actual harm or be in imminent danger of such harm. To get around this, the NRA wants the state legislature to eliminate the standing requirement but only for lawsuits challenging local firearms ordinances. Anyone who can lawfully own a gun in PA would be able to sue any town with a gun ordinance. And, any organization with such a person as a member could sue as well. This fundamentally changes how our legal system works. The law also changes the traditional rule that each side pays its own court costs. A city that loses a lawsuit would not only pay its own fees but also the other side’s costs. But this rule only works one way – if the city wins, it gets nothing. And, we the taxpayers bear the burden of all these expensive lawsuits, even the most frivolous ones.